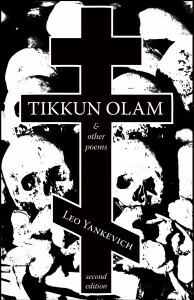 This expanded second edition of Tikkun Olam and Other Poems comprises 57 poems and one translation. Tikkun Olam was originally published as an E-book only. This is the first print edition. “Reading the powerful, ironic poems in Tikkun Olam—Hebrew for “the mending of the world”—in this new enlarged edition, visions of Goya’s Disasters of War come to mind. “Leo Yankevich wants the truth—wants it out—and uses all his considerable power as a poet to get it out, bitter and bittersweet. “Those who do not know history are doomed to re-live it,” said, I believe, Santayana. Yankevich wants us to know history, so that we need not re-live it. Is this a futile dream? But someone must do something to halt or at least to slow our simian march to doom, and Yankevich does what he can in this dark true book. “The murderous testosterone-drugged alpha-males portrayed in Tikkun Olam are not utter monsters. They are humans—husbands, sons, and brothers. They are us, or parts of us, and it is their residual humanity that is horrifying. “This is especially clear when Yankevich takes on infamously unattractive personalities and manages to find in them the germ of humanity that is just alive enough to make stark and painful how much of their humanity has been cast off. His portrait of Rudolf Hess comes to mind. I think, too, of those menders of the world who begin their mending with the murders of the Czar, his wife and children. 12. With Blood on his Hands . . .
Leo Yankevich was born into a family of Roman Catholic Irish-Polish immigrants on October 30, 1961. He grew up and attended high school in Farrell, Penn., a small steel town in the Rust Belt of middle America. He then studied History and Polish at Alliance College, Cambridge Springs, PA, receiving a BA in 1984. Later that year he traveled to Poland to begin graduate study at the centuries-old Jagiellonian University in Krakow. A staunch anticommunist, he played an active role in the dissident movement in that country, and was arrested and beaten badly on a few occasions by the communist security forces. After the fall of the Iron Curtain in 1989, he decided to settle permanently in Poland. Since that time he has lived in Gliwice (Gleiwitz), an industrial city in Upper Silesia.